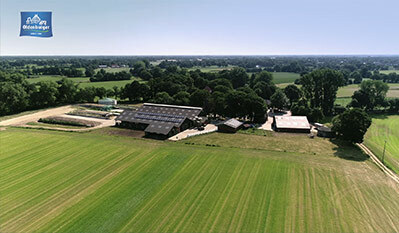 The favourable conditions of northern Germany, highest technological standards and the decades of experience of our farmers make a huge contribution to the quality of our Oldenburger products. Here you’ll see what our farmers do to look after their cows and their farms well. Naturally, the famous Oldenburger quality made in Germany begins on the farm. The cows' housing and feed, the milking process and optimal storage for the fresh milk all play a vital part in ensuring high quality. 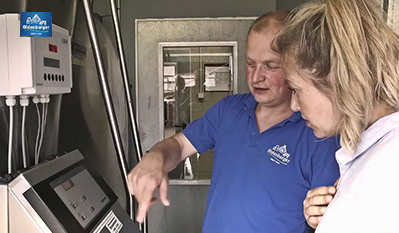 That's why our farmers, together with expert researchers and scientists, have developed a programme that covers many aspects of animal welfare and sustainable dairy farming: the Milkmaster Programme. Every farm is audited by independent experts every two years. One hundred and fifteen separate criteria are checked and the results recorded in a database. That tells us how good our farmers are now, and where there's room for further improvement going forward. 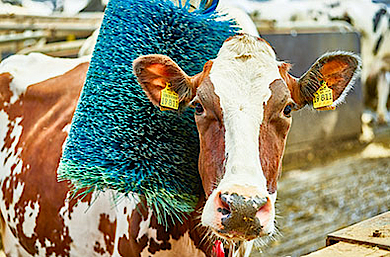 For us, cow comfort is one of the most important aspects of good animal welfare. Every cow should feel comfortable in her environment. Because when cows can behave as nature intended, they're fit and productive. 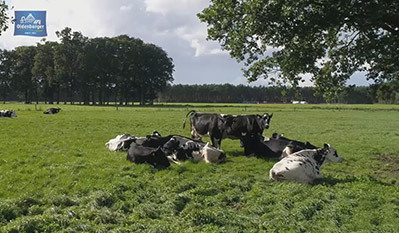 To be at their most comfortable, for example, cows should have loose housing where they can move around freely, or rest and lie down from time to time – just as they do in the meadows. Climatic conditions, light and cleanliness in the cowshed are also important. And then there's the wellness area, where cows can enjoy a massage from special cow brushes. All these aspects help enormously to ensure the high quality of Oldenburger dairy products. What cows eat also plays a crucial role. Because balanced feeding that matches their needs is the basic foundation of cows' health and of the quality of their milk. Our dairy cows are fed a specially tailored diet daily. 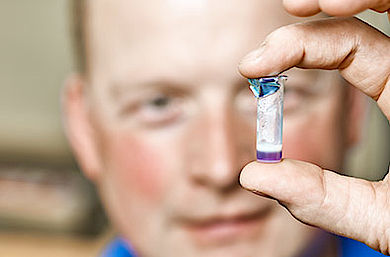 Analyses tell our farmers exactly what amounts of which nutrient the animals require. 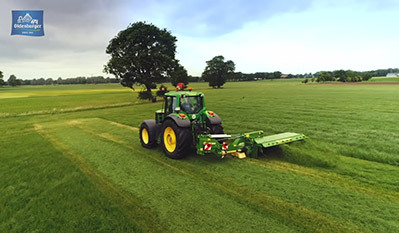 Our farmers use only high-quality feed, most of which they grow in their own fields. The cows are also given protein-rich concentrates. For these, the farmers prefer feeds that are produced in Germany or sustainably produced products from other countries. Our farmers naturally also give the cows a continuous supply of fresh, clean water. 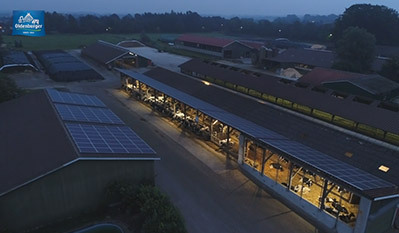 We take many measures to ensure sustainability and quality assurance on our dairy farms. Naturally, milking and milk storage are crucial here. The maintenance of the milking machinery, cooling tanks and all the other equipment needed to milk the cows and then store and cool the milk to perfection are tested regularly. That naturally includes milking hygiene and all the steps that go into keeping the raw milk in perfect condition. Oldenburger has its roots in northern Germany, in a landscape with endless green meadows. This green countryside also holds our dairy farms, where modern technology is used to produce the fresh milk for our products. 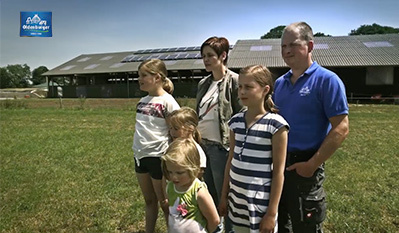 For many Oldenburger farmers, milk production is a family affair: everyone on the farm plays a part. Our farmers are proud of the fact that many other families all over the world enjoy delicious, healthy Oldenburger products made from their milk. Do you know what a milk room is? Our video will show you. 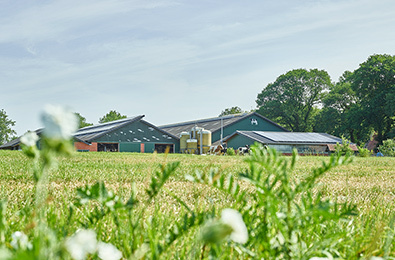 You'll see for yourself how our farmers ensure high quality – both when milking the cows and when storing the fresh, raw milk - thanks to decades of experience and modern technology. Working with animals demands enormous intuition and a wealth of experience. You have to be able to see whether the cows feel good and know the best way to handle them. Many of our farmers learn all these things from childhood. An app on our smartphones tells us how many steps we take each day. But how much exercise does a cow get? Our farmers can see that on their smartphones as well. They can tell at all times whether every individual animal is fit and healthy. How does it work? Just watch the video. 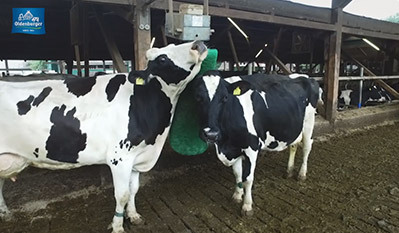 Did you know that cows love a massage, and that they retreat into their cool cowshed to avoid the summer heat? Naturally, our farmers do know. They take a lot of different measures to ensure that the animals feel good in every way. Because cows have to feel good to give plenty of good milk. Milk, yoghurt and cheese contain valuable vitamins, minerals and proteins that are important for our bodies. Cows need the right nutrients to stay fit as well. That's why their feed plays an important role. But how does the farmer know that each cow always gets the right amount of nutrients? You'll find the answer in the video.